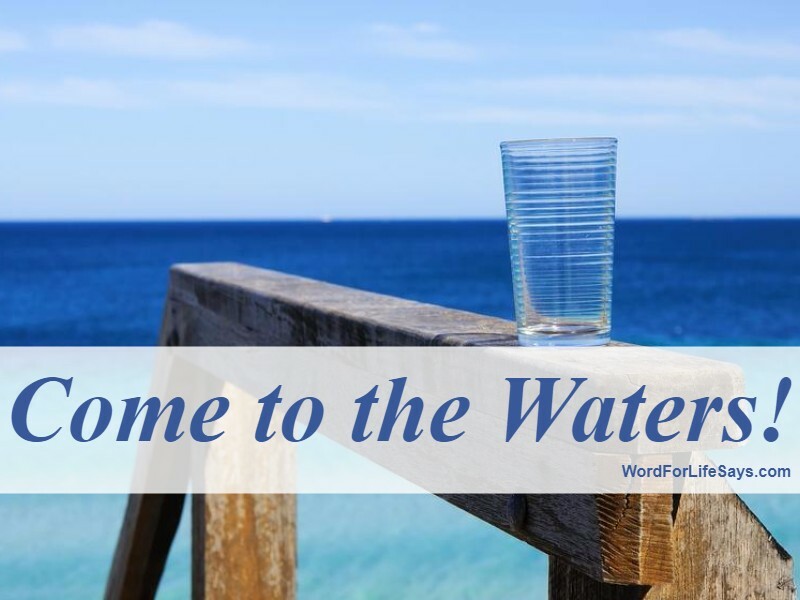 Come to the waters, the Lord beckons. This world will tire you out and the pursuit of it will leave you drained. Refreshment can only be found in Him. As one traipsing through a desert of darkness that this world so often leads you through, His plentiful Spirit will satiate the aridness and will water your life where it was once dry. Do you need that touch from Him? Do you need that refreshing spring that flows from the everlasting Father? Do you need the tenderness and hope that can only be found in the stream of His salvation? Do you need to be rejuvenated into new birth in the waters of His spiritual deliverance? Don’t lighten your pace. Run with haste to the pool of His mercy and grace, and come. Don’t let anyone stop you from dipping in. Dive in with full surrender and with full abandon, and come. A sip just won’t do. We are thirsty for You, O God! We have nothing to offer for the price You paid, yet, You say come. We have no value on our own, but You speak, come anyway. There is no good thing that dwells in our flesh (Romans 7:18), but You invite us to draw near to You and come. Come to the waters. Step into the abundant life He so offers (John 10:10). Come and let your soul be spiritually satisfied. Come and take the offer of His salvation for yourself. Come, and don’t turn away. Don’t give up this great treasure that can only be found in God. Don’t let the delight of what the Lord Jesus Christ bought for you on that cross slip through your fingers. “Incline your ear, and come to Me. Hear, and your soul shall live . . .” (Isaiah 55:3, NKJV). Live in Him. Live in the peace He offers through the pouring out of His blood. Live a life free from spiritual drought because you were once thirsty and you came and partook of His holy waters. Yes, this world will dry you out, but He restores, He redeems, and He puts in right fellowship with Him every thirsty soul that comes to Him and drinks. Jesus said, “But whosoever drinketh of the water that I shall give him shall never thirst; but the water that I shall give him shall be in him a well of water springing up into everlasting life,” (John 4:14). Therefore, come to the Water!